I have a patient with leukemia whose blood values and symptoms have been better than ever corresponding to her initiation of Sutherlandia over the last 3 years! All personal details that are submitted to Sutherlandia.org are kept completely confidential and are not given out to any third party. 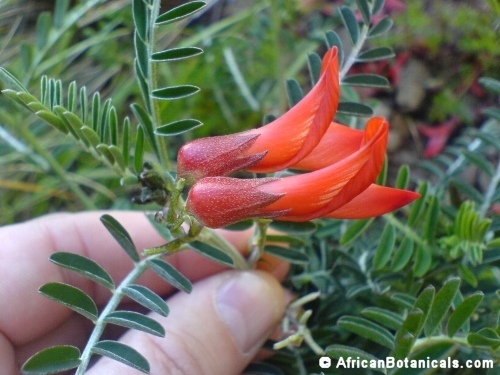 Sutherlandia frutescens is regarded as the most profound and multi-purpose of the medicinal plants in Southern Africa. Because of its efficacy as a safe tonic for diverse health conditions it has enjoyed a long history of use by all cultures in Southern Africa. Sutherlandia powerfully assists the body to mobilize its own resources to cope with diverse physical and mental stresses, and it should therefore be more correctly known as an adaptogenic tonic. The traditional Tswana name Phetola alludes to this: Phetola means it changes, meaning that the plant changes the course of many illness into a favorable outcome. (Similar to the European concept of an alterative). The North Sotho name Lerumo-lamadi means the spear for the blood meaning that Sutherlandia is a powerful blood-purifier or all-purpose tonic. To get a copy of the safety study results in pdf format, click here. appetite stimulant in wasted patients, but not in healthy people. Lax spreading shrubs to 1,2m high, with prostrate to erect stems; leaves compound pinnate with leaflets oblong to linear-elliptic, mostly three or more times longer than wide, slightly to densely hairy, the latter silvery in appearance; flowers (Jul-Dec) bright scarlet, borne in terminal racemes; fruit an inflated leathery pod, 1.3-2 times as long as wide, bearing a persistent upturned style; seeds black, flattened, ± 3mm in diameter. 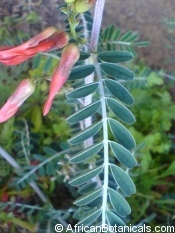 Sutherlandia frutescens is one of five currently recognised Sutherlandia species, all of which are confined to Southern Africa. The species are difficult to distinguish because they often grade into each other and some botanists consider them to be merely different forms of a single large and variable species. Three of the species, Sutherlandia frutescens, S. microphylla and S. tomentosa have overlapping distributions in the Western Cape Province and are probably used interchangeably in this area as kankerbos. a substance that invigorates or strengthens the system (also called a tonic). Increases the body's ability to adapt to internal or external stress. is a term that applies to herbs that maintain health by increasing the body's ability to adapt to environmental and internal stress. Adaptogens generally work by strengthening the immune system, nervous system and/or glandular systems. A substance that modifies the metabolism of the body to combat particular forms of environmental stress. herbs that act in a nonspecific way to strengthen the body and increase resistance to disease and stress. All information Copyright © 2016 Sutherlandia.org. Written permission is required for its duplication in any form. All medical information is provided for educational purposes only and should not replace the advice of your doctor.